Tahoe City, CA – There’s nothing like a three-foot snowfall to get the ball rolling. This week’s powerful early winter storm in the Sierra has prompted two California ski resorts to fire up their lifts. 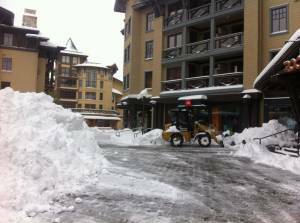 Squaw Valley will open for a single benefit day on Thursday, while Boreal on Donner Summit will get things started for the season on Friday. Skiers and riders are invited to make their first turns this Thursday at Squaw Valley for a special, one-day Welcome Winter Fundraiser in celebration of the significant pre-season snowfall and to help raise funds for the newly formed Squaw Valley & Alpine Meadows Teams Foundation. The first storm of the season has already dumped up to three feet of snow on Squaw Valley and Alpine Meadows with more snow on the way. In celebration of this good fortune, Squaw Valley will run the Searchlight chairlift on Thursday from 10 a.m. until 2 p.m. to offer skiing and riding with a $20 lift ticket with all proceeds going to the Squaw Valley & Alpine Meadows Teams Foundation. With snow still expected to fall through the day today, the first snow storm of the 2012-13 winter season has already delivered 28 inches to Squaw Valley and 36 inches to Alpine Meadows. Another six to nine inches are expected by Thursday, which would bring snow totals to more than three feet. Meanwhile, Boreal is making snow to supplement the storm’s bounty of 14 to 16 inches thus far, and is shooting for a Friday opening with at least two lifts in operation. “It looks like a great snowmaking opportunity follows the storm so our team is ready to get to work and provide the early season skiing/riding they have come to expect from us,” said John Slaughter of Boreal. At the other end of Lake Tahoe, the storm has dumped 14 to 18 inches of new snow at Heavenly Mountain Resort and 17 to 24 inches at Kirkwood Mountain Resort since Sunday night. “This storm has definitely shifted the mindset of people at Lake Tahoe and has them thinking about winter now. The cooler temps and blanket of snow everywhere really makes it feel and look like winter,” said Pete Sonntag, Heavenly’s general manager. Heavenly kicked off its snowmaking effort on Monday night. With weather and conditions permitting, Heavenly is slated to open for the 2012-13 ski and ride season on Friday, Nov. 16. Kirkwood will open on Wednesday, Nov. 21, weather and conditions permitting.